Ward, who’s mulling a primary challenge of six-term incumbent Sen. John McCain, joined Matthew Boyle on Breitbart’s Sunday news radio program to discuss the political games that led to confirmation of Obama’s choice to replace Eric Holder as U.S. Attorney General. Those games are a major reason she might seek higher office. 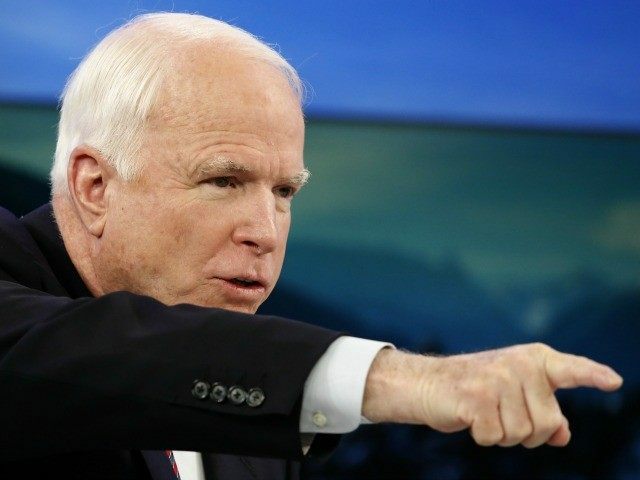 “Things are going along very smoothly, we’re still seeking that political and that financial pathway to see if this is going to be a possibility for me to be able to take on our sitting Senator John McCain. It is quite a bit like trying to slay a dragon,” Ward said when asked about her potential candidacy. Things are going very well, fundraising is going great, there’s a huge outcry, there’s a huge hunger for an alternative to the status quo, to what we have right now. People are looking for somebody new, somebody fresh, somebody bold, somebody who’s not afraid, somebody fearless, who’s got backbone, who’s not going to bow down to forces in Washington, D.C. that are not the voice of the people. A lot of people think that might be me. So I’m working really hard to move forward. I think sometime in the summer we’re going to be able to make a decision. Boyle then asked Ward about Loretta Lynch, who’s been criticized for her support of Obama policies including his executive actions on amnesty. Ward expressed her belief that McCain was “playing politics,” evidenced by his failure to launch a legitimate opposition to Lynch. He’s the senior Senator. I’m told all the time about how much influence he has to be able to affect change, but he didn’t use that influence to try to rally other colleagues to oppose her nomination. I think he’s got failed promises all around, failed promises on our border. There’s a border crisis going on here in Arizona and across our southern border. He’s not leading on this issue. I really think that his general support for amnesty tells the real story. Boyle recalled McCain’s 2010 campaign ads when he faced a primary challenger. In those ads McCain promised to “build the danged fence” on the southwest border with Mexico. Arizonans have since noted that no such promise has been fulfilled. “I think that his failed promises on immigration ought to be a huge issue and people need to remember it,” Ward said. Boyle also asked Ward whether her experience as a medical doctor would be helpful in the Senate, especially since she’d be another physician involved in the Republican conference and in fighting against Obamacare. In the emergency department, Ward said she can see the good, the bad and the ugly of Obamacare first hand. There’s a lot of bad and there’s a lot of ugly. I think that some of that is because we’ve had bureaucrats and ivory tower type people telling us as America what we want and what we need for our healthcare. I can tell you that, as a practicing physician, I am appalled at Obamacare. It’s the reason why I ran for office. It is the biggest single takeover of patient liberty and freedom that we will ever see in our lifetime. “Everybody here who’s listening should be concerned because everybody has the potential to be a patient. On the patient side it affects everyone across the United States. On the physician side, for me it’s a big takeover of my ability to take care of my patients, to have a doctor patient relationship, to be able to treat who I want to treat, how I want to treat them, when I want to treat them, no matter what the government says. The government wants to intervene and tell me who I can treat, when I can treat them, how much they’re going to pay me, if it’s worth it actuarially to treat a certain patient because of a certain age or a certain health problem that they have. We have got to never forget about Obamacare, not saying things like “oh well it’s already the law of the land, so just deal with it.” Which is what I think that our senator has done over time. He actually voted to fund Obamacare and then he scoffs at the people that want to fight against funding it and fight against Obamacare, which is a very unpopular program. “I think a lot of the attacks have already been debunked,” Ward replied. We’re seeing these attacks, not necessarily for Senator McCain, but from his people. They want to try to make me seem as though I’m something I’m not, but I can tell you that I am a well-educated, well-spoken, down to earth, constitution loving female that wants to get into office not as a career politician, but as somebody who can serve the public and make sure that we have government of for and by the people, now and into our future. If I decide to run, that’s what I will run upon.